Biomedical foams are a new class of materials, which are increasingly being used for tissue engineering applications. Biomedical Foams for Tissue Engineering Applications provides a comprehensive review of this new class of materials, whose structure can be engineered to meet the requirements of nutrient trafficking and cell and tissue invasion, and to tune the degradation rate and mechanical stability on the specific tissue to be repaired. Part one explores the fundamentals, properties, and modification of biomedical foams, including the optimal design and manufacture of biomedical foam pore structure for tissue engineering applications, biodegradable biomedical foam scaffolds, tailoring the pore structure of foam scaffolds for nerve regeneration, and tailoring properties of polymeric biomedical foams. 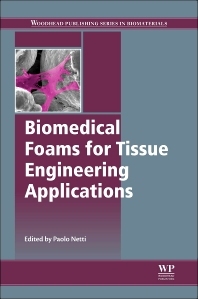 Chapters in part two focus on tissue engineering applications of biomedical foams, including the use of bioactive glass foams for tissue engineering applications, bioactive glass and glass-ceramic foam scaffolds for bone tissue restoration, composite biomedical foams for engineering bone tissue, injectable biomedical foams for bone regeneration, polylactic acid (PLA) biomedical foams for tissue engineering, porous hydrogel biomedical foam scaffolds for tissue repair, and titanium biomedical foams for osseointegration. Biomedical Foams for Tissue Engineering Applications is a technical resource for researchers and developers in the field of biomaterials, and academics and students of biomedical engineering and regenerative medicine. Paolo A. Netti is a Professor of Material Science at the Department of Chemical, Materials and Production Engineering, University of Naples Federico II, Italy and the Director of the Centre for Advanced Biomaterials for Health Care of the Istituto Italiano di Tecnologia.